This new SerialBrain2 post just came to my attention via my viewing an AndWeKnow video. Another powerfully unveiling message. And an indication that Nancy Pelosi may be sending codes as well. Also the use of Roger Stone as “sacrificial lamb” was fascinating. 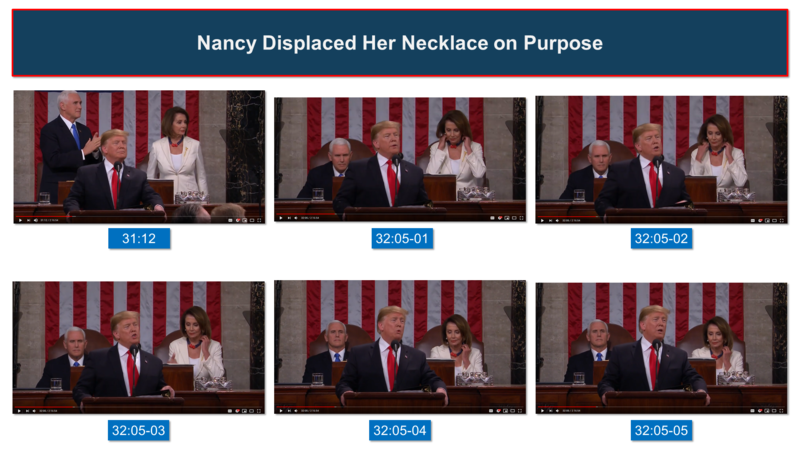 Some may wish to check out Img6, which is a sequence showing NP adjusting her necklace (shifting the red to the right). The And We Know video highlighting this SB2 post has already been created. ““Tonight, I ask you to choose Greatness”. This line alone sums up all the high aspirations this man has for our country. It’s not about one guy being low or another guy being high or kicking anything, it’s about ALL OF US being GREAT! What a lesson… This speech was pure political GENIUS. “I took a closer look at Nancy’s necklace. Did you notice that during the Maestro’s speech, it was heavily leaning to the right?… At 31:33, the Maestro confirms his 16:41 tweet about unity… Stand up ovation. Nancy claps, and as she is sitting down… Nancy displaced her necklace and made it lean to the right immediately after POTUS called for unity. Coincidence? Is she signaling she is ready to move the red and blue pearls of the House more to the right and meet Trump halfway? “Now you know why Stone’s arrest had to be mediatized… the timestamp of the Maestro’s tweet about CNN: 11:16 AM. Let’s go to Q1116. It says: “Thank you Xi, good start”. Do you see it? The White Hats activated China to tip off CNN and they are thanking them for doing so! 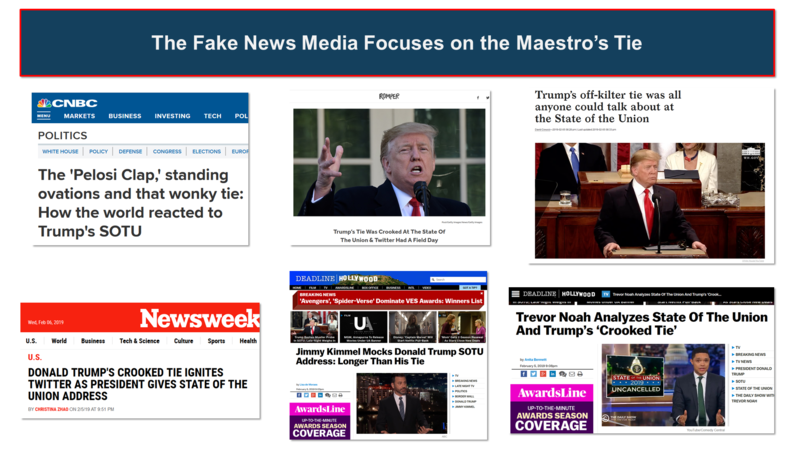 “This achieved 2 things: 1) China gave proof of their control over the media 2) tested and verified comms at intermediary level… The intermediary level comms with China were skillfully shut down by the Maestro to destabilize their intel assets in the US. Look at the polls Img0 This speech was pure political GENIUS. All this got me thinking. I took a closer look at Nancy’s necklace. Did you notice that during the Maestro’s speech, it was heavily leaning to the right? Was it a fashion fancy or the way the necklace was designed? 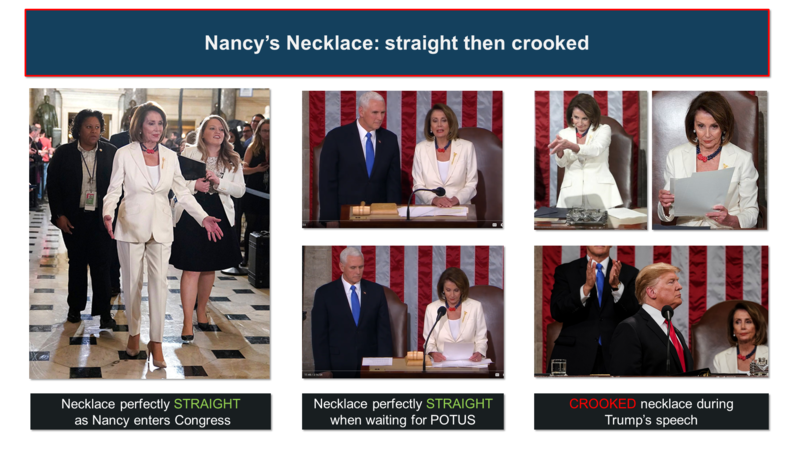 Img3 A picture of Nancy entering Congress shows it’s none of the above: her necklace was perfectly straight. It was also perfectly straight as she was standing next to VP Pence waiting for POTUS. It only got displaced at some point during Trump’s speech. Next? 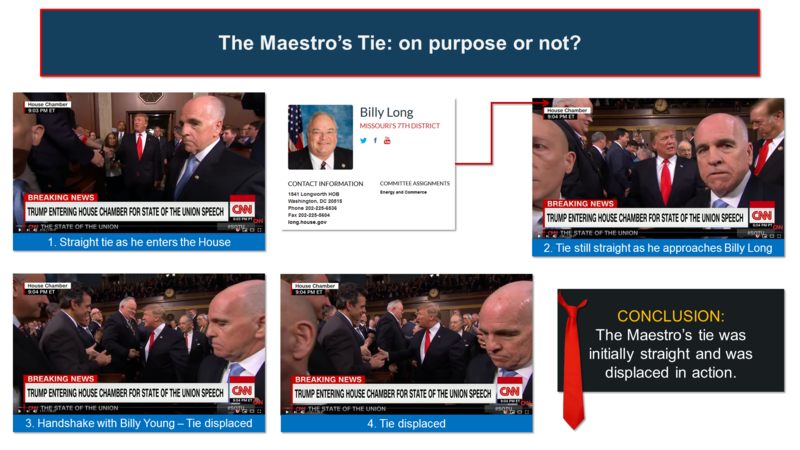 We have to determine, just like we did for the Maestro’s tie, how the necklace was displaced. 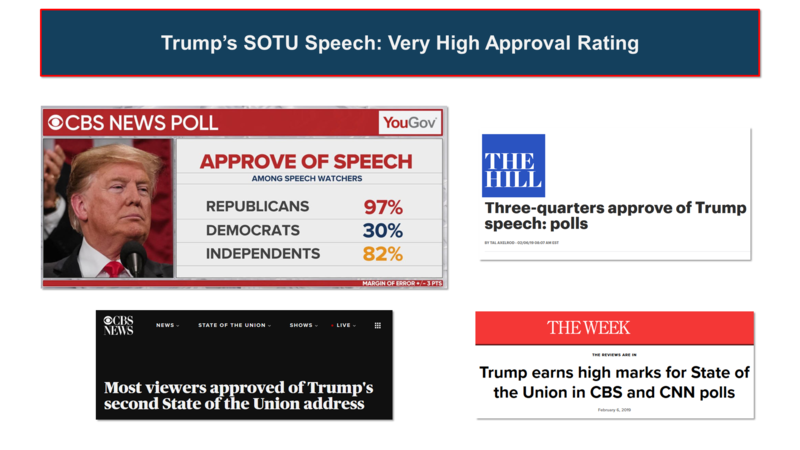 To remain consistent, let’s stay with the Fox News feed: Img4 Look at the screenshots at 31:12, when POTUS introduces FLOTUS and at 35:40 when he introduces Joseph Riley, Erving Walker and Herman Zeitchik. Nancy’s necklace has noticeably moved to the right. We now know something happened between 31:12 and 35:40. 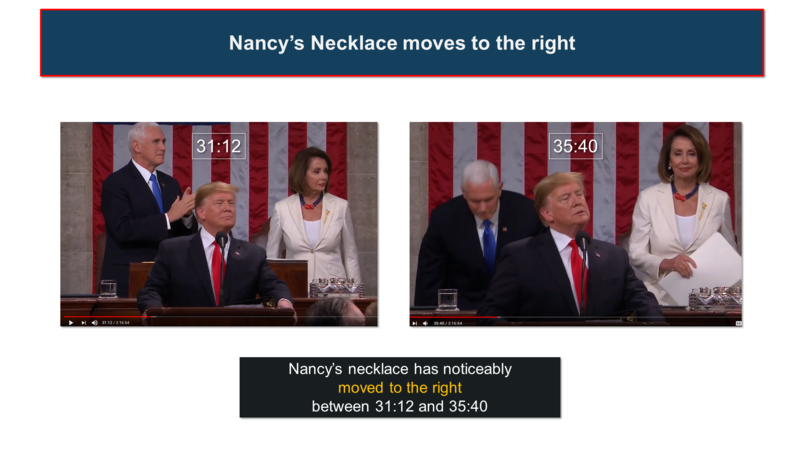 Now you know that Nancy’s necklace represents the House and that its colors were not chosen randomly. Red for Republicans, blue for Dems. Nancy is an experienced politician. She knows that when her opponent has demonstrated his skills and power, the smart thing to do is to accommodate him as much as she can and that is what that necklace leaning to the right means. 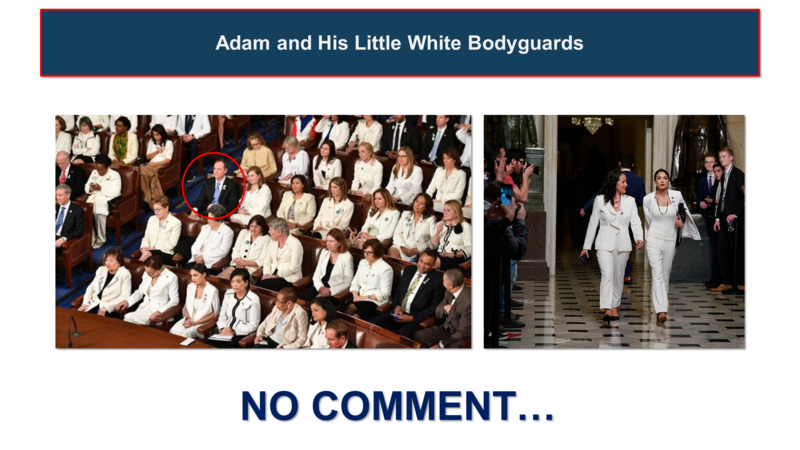 Did you notice Adam and his Little White Bodyguards Cortez and Co? Look: Img8 Soon, it’s going to get bloody between Nancy and her far left wing. I can tell you that. Q1009 Why is Mueller going after ‘inside plants’? Q2102 What happens if Mueller ‘proves’ ‘Free Speech Systems LLC’ aka ‘InfoWars’ is linked to a Foreign Intel Agency or other Non_Domestic entity? Another function of the sacrificial lamb is that Stone lied to Congress and his arrest sets the stage for the future arrest of all those who lied to Congress, as rightly pointed out by our excellent Sarah Sanders here. Now you know why Stone’s arrest had to be mediatized. But then how do you activate the Fake News media when they hate you? Img11 Answer: you talk to their boss. If you are attacked by an angry dog, would you rather “negotiate” with the dog or with the one holding the leash? Look at the timestamp of the Maestro’s tweet about CNN: 11:16 AM. Let’s go to Q1116. It says: “Thank you Xi, good start”. Do you see it? The White Hats activated China to tip off CNN and they are thanking them for doing so! The intermediary level comms with China were skillfully shut down by the Maestro to destabilize their intel assets in the US. This worked so well, the Chinese Ambassador epically complained about it in front of an astonished Chris Wallace. Video. Gallery | This entry was posted in apocalypse, cabal, energies, new energies, partners in contrast and tagged Adam Schiff, China, Nancy Pelosi, President Donald J. Trump, Roger Stone, SerialBrain2, Xi. Bookmark the permalink.